St. Mark’s Church and Boy Scout Troop 44 have shared a long, mutually beneficial relationship over the last 98 years, interrupted by only one year during World War II when there were no leaders available. 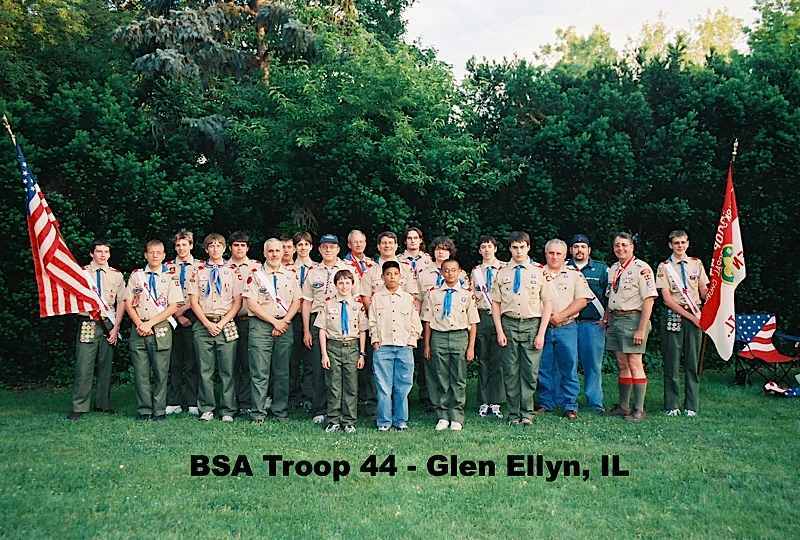 Boy Scout Troop 44 is one of the longest continuously chartered scouting organizations in Glen Ellyn. We consider the “outing” part of “Scouting” crucial to maintain scout interest and activity. To accomplish this, we sponsor a camp outing every month of the year. Each camping trip involves a variety of outdoor activities including canoeing, swimming, fishing, hiking, orienteering, first aid, fire safety, nature, wildlife studies, pioneering, and cooking. We provide this exciting program to the boys of Glen Ellyn and surrounding communities. Every summer, the troop sponsors a week-long Summer Camp and one or more one-week or two-week high adventure trips. Typical themes for the high adventure trips include backpacking, canoeing, kayaking, biking, and rafting. The troop has been a service-oriented member of Glen Ellyn and the surrounding communities throughout its history. We actively participate in community service projects as a troop, and attempt to sponsor many service projects in the year. Troop 44’s connection with St. Mark’s has been beneficial to the troop and the church in many ways, with the troop providing support and assistance wherever possible. If you are interested in joining the Scouting program and/or Troop 44, we welcome you to attend one of our Monday night meetings at St. Mark’s Church from 7:00 pm – 8:30 pm.